In continuing with a new tradition I started last year, I decided to do my Christmas Shopping in Syracuse as this would give me a decent enough excuse to take Amtrak again. Today would be my 5th trip for 2002 and my 22nd overall since 1996. In planning this trip, I checked out Amtrak’s Web Site and found 2 Rail Sale Seats for the Lake Shore Limited and a 35% Off Ticket on Train #63 – The Maple Leaf. My purpose for going to Utica was to allow me to spend more time on the Lake Shore. I would ride from Buffalo to Utica on Train #48, then sit in Utica and photograph the station and such for an hour before catching Train #63 back to Syracuse, do my shopping, maybe get in some trainwatching, then ride Train #49 back home. Let’s just say, this was a lot more difficult to do than originally planned as this trip ended up having one missed connection and a radical change in plans at the last minute. My Coach was Amfleet II #25016, this was an unrefurbished coach on the inside with the red interior but it was repainted outside in the new “Phase 4B” Paint which features the new Amtrak Logo on a modified version of the “Phase 4” Paint scheme which features 3 thin white and 2 thin red strips on top of a large wide blue strip between the windows. 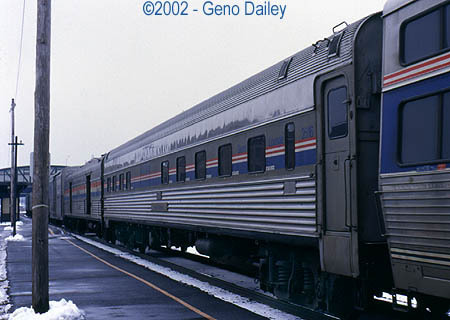 The number plate in the middle of the side of the coach now simply says “Amtrak” instead of the car number and there is a red stripe along the top and bottom sides of the coach. This is now the new standard paint scheme for Amtrak and will be spread to most all of the equipment as it is shopped or repaired. The coach was very warm and about half-full. I had an aisle seat when I boarded and the passenger who was in the window seat was nowhere to be found when I boarded. We sat at the station some more while some work was being done on the end of the train as well as while mail and checked baggage were being loaded on the train. They had to make a double spot while in Depew to accomplish this and at 8:45am, we left, running now 1 hour and 49 minutes late. As soon as we left, I headed to the dining car to have breakfast. One of the greatest things, in my opinion about train travel is the chance to eat a meal in the dining car, you meet lots of interesting people and the scenery out the window constantly changes. I ordered the Pancakes with a side of Home Fries (Amtrak calls them “Breakfast Potatoes”) and a Croissant. They were out of breakfast meat (Bacon and Sausage) and for some reason, though this didn’t effect me since I don’t drink coffee, they had no coffee in the car and had to get it from the lounge car. If that’s a cost-cutting move, its stupid. I had an orange juice to drink, the meal was delicious, though the server made a minor error and gave my home fries to the passenger sitting next to me who didn’t order any! The server did apologize and as I said before, the food tasted hot and delicious! I was seated with 3 other passengers, one from Cleveland, one from New Hampshire and one from New York City, we must have stayed in the dining car for nearly an hour as it was actually when they were closing up as breakfast was over, and nobody else needed our seats. After breakfast, I went back to my coach seat and found the other passenger who I said before was nowhere to be found when I boarded, and she acted as if both the window and aisle seats belonged to her! She then said she has to be able to spread out over 2 seats and rest so she chose to move to the other side of the car, I helped her with her belongings and ended up taking the window seat myself, and didn’t have another passenger sit in the aisle seat next to me for the rest of the trip! Just about 2 miles from the Rochester Station, we got stopped to let a slew of freight traffic as well as Amtrak Empire Service Train #286, pass us while we sat there, twittled our thumbs and waited for about 30 minutes before we could move again! After we moved again, our conductor made an announcement saying we got held up due to freight and passenger train traffic! We arrived in Rochester and left at 10:13am, now 2 hours and 3 minutes late. After leaving Rochester, I walked around the train to take down my car numbers and found that since my last trip, the makeup of the train is completely different. Because the Café Car now goes directly to Boston and No Café Car runs between Albany and New York, this train is now set up as follows: 2 Locomotives, 1 MHC, 1 Baggage Car, 1 Viewliner, 2 Amfleet II Coaches, 1 Amfleet II Café Car, 1 Heritage Diner, 3 Amfleet II Coaches, 2 Viewliners, and a Baggage Car. The New York Section is everything after and including the Heritage Diner. This was done to facilitate running the Café Car to Boston but is now a headache for the dining car crew as the dining car is now located centrally in the train and passengers walking throughout the train must walk through it to get to or from their coach or sleeper. What would make more sense would be to run the dining car in its old position behind the New York Section’s sleepers, then run the coaches together then run the Boston Café Car in front of the Boston Sleeper, doing this would not only keep all the coaches together but would allow the dining car crew to be able to clean and set up the dining car without passengers getting in the way unintentionally. Since we had a Café Car with no smoking room on one end, certain times were designated as smoking break times in one end of the car. As a matter of fact, the cafe car on today’s train was actually in its old configuration of having tables in different positions with seats, a bar in the middle and regular tables on the other end. I think the last time I rode in one of these must have been back in 1997, so it was an experience having one on this train as most of them have been refurbished with a smoking room added on one end. Our next stop was in Syracuse where we left at 11:34am, now 2 hours and 4 minutes late. I asked permission to photograph the dining car and was told that I could after we left Albany, but because I was getting off in Utica, that wasn’t possible. I will say it looked like a refurbished design with a two-tone gray interior, I know for a fact that it was not a Temoinsa Refurb as those are pink and green inside. Regardless, it was a nice experience eating there, the car was clean, neat and warm. Now here’s where things started getting interesting, my itinerary had me riding to Utica and riding back to Syracuse on Train #63 – The Maple Leaf. As I have noted before, the Lake Shore was now running some 2 hours behind schedule and I only had a 1 hour and 11 minute window of time according to the schedule to make the connection in Utica. Because of our lateness, the only way this connection was going to be made was if Train #63 was also running late, that didn’t happen as I witnessed Train #63 whiz by us somewhere near Rome, NY doing about 80mph! So I said to myself, OK, time for Plan B! When I arrive at Utica, I’ll have to get my ticket exchanged so I can use Train #281 to get back to Syracuse. 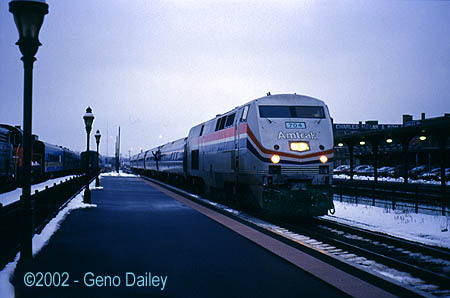 I’ll ride Train #49 – The Lake Shore Limited, back home as planned, later on from Syracuse. The Lake Shore Limited doesn’t stop at Rome so we just flew through there. I arrived at Utica at 12:26pm, 2 hours late. Right after I got off the train, I took pictures of several of the train’s cars, until the train left, bound for New York and Boston. The trip was smooth, despite its lateness and the ½ hour of twittling our thumbs outside of Rochester while we waited for other freight traffic. The crew was friendly and the dining car crew was good as well. Train #48’s schedule was barely modified only a minute here, another there, no big deal. Probably the biggest change I noticed in this train was its setup which I explained before. After walking around outside the Utica Union Station, I took some slides of the building along with the several pieces of equipment belonging to the Adirondack Scenic Railroad who’s Southern Terminus is at Union Station. 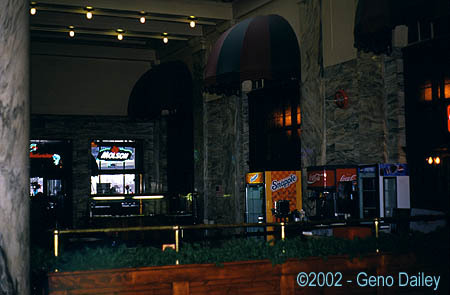 I took some interior slides of the station also, as this station is absolutely beautiful inside! Marble walls and original wooden benches for passengers to sit on while waiting for their train or bus. 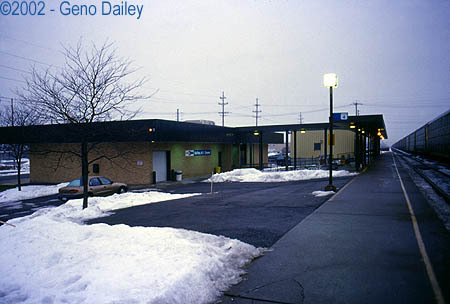 The station is also the Greyhound/Trailways Bus Terminal as well as a major stop for the Utica Transit Authority buses. There is a small restaurant inside along with a snack bar as well as a local office of the Department Of Motor Vehicles. Amtrak staffs this station and checked baggage service is available on the Lake Shore Limited from Utica. 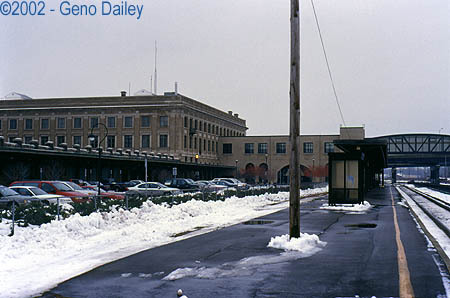 Upon arrival in Syracuse, around 5:10pm, I walked inside, had my suitcase stored that I used for hauling the presents I was buying and I walked over to the Carousel Center to get the rest of my shopping done. I was in and out of the Carousel Center in a matter of about 40 minutes! (I always try to make quick work of shopping!) I walked back to the Station and had a few minutes before I had to be on the platform waiting for the train that would take me home, Train #49 – The Lake Shore Limited. The sign at the station read that it was running about 10 minutes late. This would mark the first time I’ve rode this train under its new, heavily modified schedule. I ran into Dunkin Donuts and had a few donuts while watching come CNN Headline News while waiting for the train. Because of 49’s new schedule, I would not only get home at a decent hour but be able to have dinner in the Dining Car. 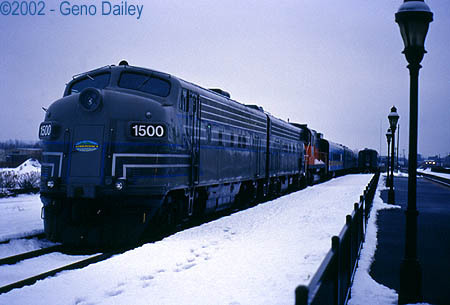 At 6:55pm, Train #49 – The Lake Shore Limited arrived into Syracuse. This was a designated smoking break as we sat at the platform for about 15 minutes. Tonight’s train consisted of P42’s #81 and 70 for power. My Coach was Amfleet II #25078, a refurbished coach which was clean inside though one bathroom was out of service. Tonight, there wasn’t that many people in the coach and this is unfortunately indicative of the apparent drop in ridership that this train has experienced since it went into this new schedule. We left Syracuse at 7:11pm, I wanted to get to the Dining Car right away but for some reason, nobody came and took my ticket right away, so I sat and waited for about 15 minutes, still nobody around to take the ticket, by then, the dining car server came into our coach and I asked him if they were still open, it turns out that they were just about to close the car down when we left Syracuse but he told me to wait and see what was still available. They had no Filet Mignon but did have Barbecued Chicken so I had the Barbecued Chicken and a huge side of Rice Pilaf. I had to eat it at my seat though since the car was closing down, which didn’t bother me entirely because the chicken was absolutely delicious! The rice was tasty too so once again, Amtrak gets it right with the dining car food! I took the plate back to the Dining Car and once again tried to find a member of the train crew to take my ticket, I eventually found someone and she gladly took my ticket, and apologized for the delay. Shortly after leaving Rochester, I ran into the Café Car, which on tonight’s train was an Amfleet I which makes no sense as this train is almost exclusively equipped with an Amfleet II Café Car that usually has a smoking room built in. 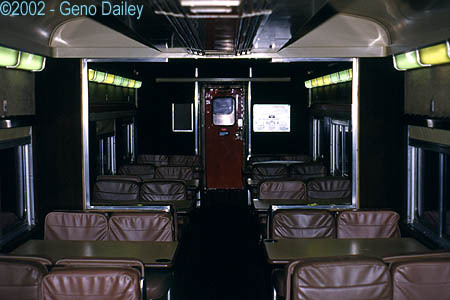 In this case, the seating normally used as “Custom Class” seating was used as the smoking area at designated times. The bartender told me she normally worked on the Northeast Corridor so this was a different train for her than what she was used to, but she liked the type of café car we had much more than the Capstone Cars used on the Corridor. For me personally, I have never rode in a Capstone Car so I would be excited to see what one was like, well, someday maybe. I bought a Bud Light and a barbecue rib sandwich and took it back to my seat, put on a MiniDisc of Smooth Jazz Music and enjoyed the rest of the ride in a nice relaxed setting! At 9:37, we arrived at Buffalo-Depew Station where my journey would end for tonight, after a very long but productive day where I was able to accomplish what I set out to do and involve riding Amtrak with it. My overall observations on this trip: First, Train #49’s new schedule is a really bad idea, and I know that under its original schedule, it ran through Buffalo after 3:00am back in the mid-1990’s, but at least it got into Chicago at a decent early afternoon time. The ridership that I noticed on the train looked to be way down even compared to how “down” it was on my last trip, under the old schedule. I have no exact figures but I think it’s safe to say that this new schedule was a definite step in the wrong direction to improve this train. As I have read, the State of Ohio is really upset about this change as this train had decent ridership and a decent arrival time in Toledo which it no longer has. In the 1990’s, it arrived into Cleveland at a decent time as well. Aside from the schedule, the dining car on the trip home looked to be the “runt of the litter” of all of Amtrak’s Heritage Diners. This car had the orange painted doors on each end, the paint outside was badly faded and the roof was leaking in the hallway near the kitchen galley when I walked into the car. To better illustrate how OLD this car looked, the windows still had those old shades in them! This isn’t good PR for Amtrak, this car should be refurbished, lets hope the money becomes available to do so. The setup of the train is really dumb, they could easily facilitate running the Café Car all the way to Boston by simply including it in the Boston Section behind the Viewliner, then putting the New York Dining Car behind the New York Viewliners. This would allow all 5 of the coaches to still remain together and people wouldn’t have to unintentionally walk through the dining car while crews are desperately trying to clean it! 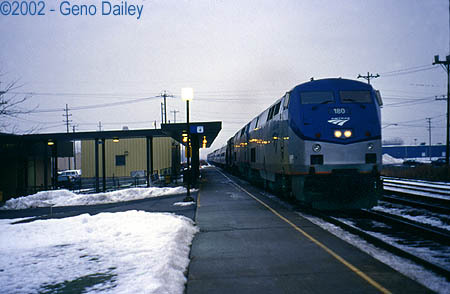 Amtrak's Buffalo-Depew Station, built in the late 70's, it is located just a couple miles from the Buffalo-Niagara International Airport and public transportation along with plenty of free parking is available if you plan to be out of town for awhile. Heritage Diner #8524, a former Southern Railway Diner was on this morning's train and the crew served up some great pancakes! Sitting just a couple miles West of the Rochester station, we wait, wait, and wait some more, some 40 minutes for freight traffic as well as Amtrak Train #286 to pass us! The photo above is of the back of a Tops Supermarket in Rochester. 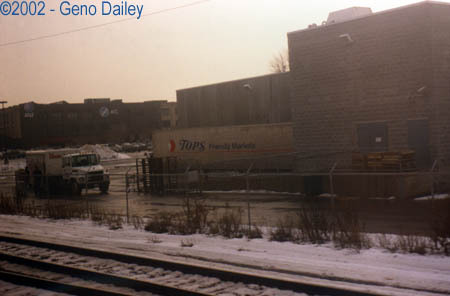 Tops was my employer at the time this travelogue was originally written, as I worked for them for nearly 7 years. Amtrak 10&6 Sleeper (Now a Crew Dorm/Lounge Car) #2516 "Pacific Gardens". Car is a former Union Pacific Sleeper and is used as a "rest area" for the crew. 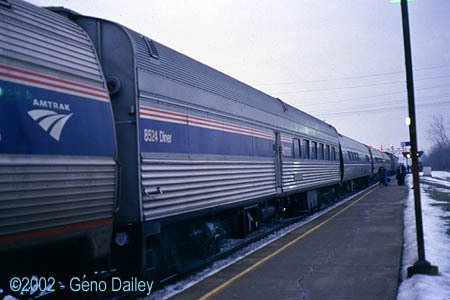 Most of Amtrak's Long Distance Trains originating in New York will have one of these cars in the consist. Utica Union Station, a former New York Central Station beautifully restored inside and out! 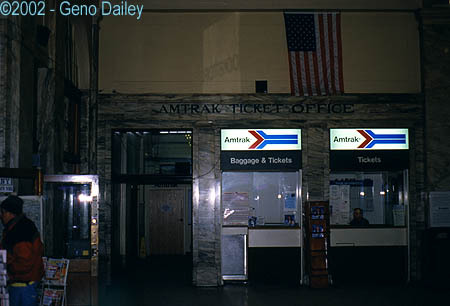 Amtrak's little "cubby hole" in Union Station. Checked Baggage Service is available on the Lake Shore Limited and is handled here. Utica sees 8 trains a day stop here. A small restaurant inside the station. 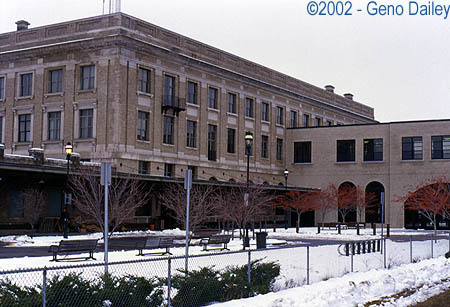 Union Station is also the Greyhound/Trailways Bus Station in Utica along with the home to a DMV Office, gift shop and snack bar. This New York Central 0-6-0 Steam Locomotive is on display at the station and appears to be undergoing a cosmetic restoration and adds a nice touch to this classic New York Central Station. 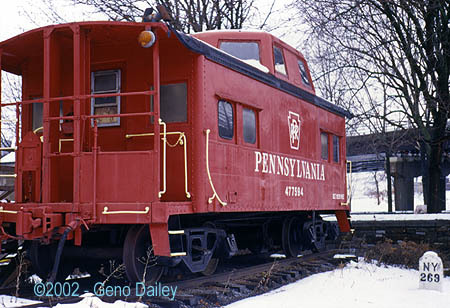 This former Pennsylvania Caboose is also on display with an authentic NYC Milepost 269 marker. This ALCO Unit (Unsure of the model) is on static display outside Union Station. 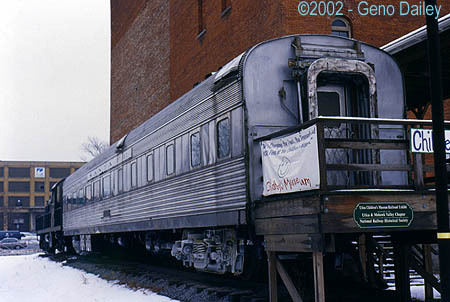 This former Santa Fe Dining Car is now used as a Children's Museum at the station. 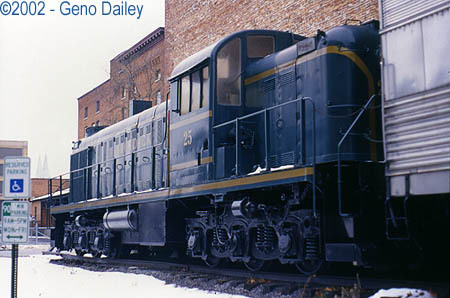 The trucks were painted silver as reminiscent of the original Santa Fe Streamliners. Looking Southwest at the station, the upstairs appears to be mostly offices today. There is a nice waiting area outside which is better used in the nicer weather of course. Utica Union Station is the Southern Terminus of the Adirondack Scenic Railroad. 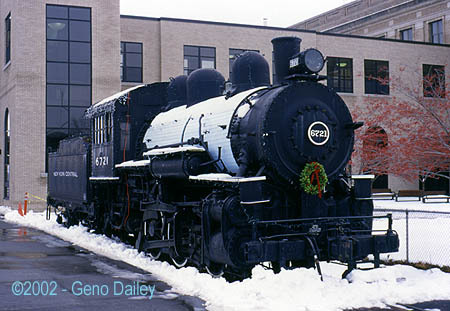 Shown here is a couple of F Units used to pull their excursion trains that will return to operation in the Spring. My train that would take me back to Syracuse. Amtrak Train #281 with P32AC-DM #704 on the lead at 4:09pm. An Interior View of Heritage Diner #8514, this car appeared to be unrefurbished at least in the last 10 or 15 years, it still had orange doors on each end! The car was also closed for service when I boarded in Syracuse!